NEW!!! 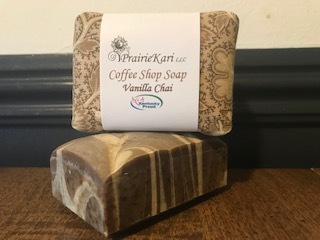 With a warm, comfort filled vanilla scent, this soap is just the thing for your family, a relaxing hot shower or for gift giving. It has the great scent of Madascar vanilla and warm chai spices--reminiscent of a Vanilla Chai Latte or a Vanilla Steamed Cow . Ingredients: Olive oil, goat milk, shea butter, coonut oil, food grade lye, fragrance oil, and titanium dioxide for color.